As discussed in last post, Sarpanch has been the major catalyst in the development. I have been to many villages from IRMA for field visits in and out Gujarat. Mr. Himanshu Patel is the most educated and enthusiastic Sarpanch I have ever met. His commitment to the development of the village and visionary attitude is the unmatched. He is a graduate in arts and belongs to a good family. He was elected as a sarpanch at a young age of 22. Before his tenure, the village was like any other village, but now it has been recognized by central and state government. Every now and then international and national delegates visit him to learn and know the secret of his success. We asked about how he has managed himself in a bureaucratic system. He explained how his never say die attitude has helped him. He struggled intially to get small things done. Now people have faith in him. He believes that Panchayats have extreme potential and all the schemes should be from bottom to top instead of top to bottom. As no one can understand the problem of people better than them and solutions can also come from them only. He stressed on the point if we try one type of solutions/ schemes Pan India, they wont be impactful. We really liked how he appreciated the importance of technology in development. His education and awareness level has played an important role in it. When asked about need of wifi in the village, he told that you need to make people habitual to these facilities. Even if one youngster from his able to make it to good college, get a good job and secure future, it is worth investing. If peaceful environment is promoted with devotional music , it is worth investing in a good sound system. If most of the people are able to make use of the schemes because of timely announcement on this sound system, it is a very economical. With the introduction of intra-village bus service, dairy production has improved significantly as women can travel to milk collection center despite any weather or health condition. Now it is easier for kids to travel to high school. The work for centrally air conditioned schools will start this summer. This is to make government school more desirable then private schools. He believes that government school teachers are more qualified and hence improving infrastructure can stop students travelling to cities everyday. With the same purpose, e-sense has been introduced in the schools and a special focus is laid on English. He has even proposed Government of Gujarat to set up GIDC nearby so that youngsters don’t need to migrate for job. While talking to him I was wondering whether the results of his efforts would had been same if it was not Gujarat. 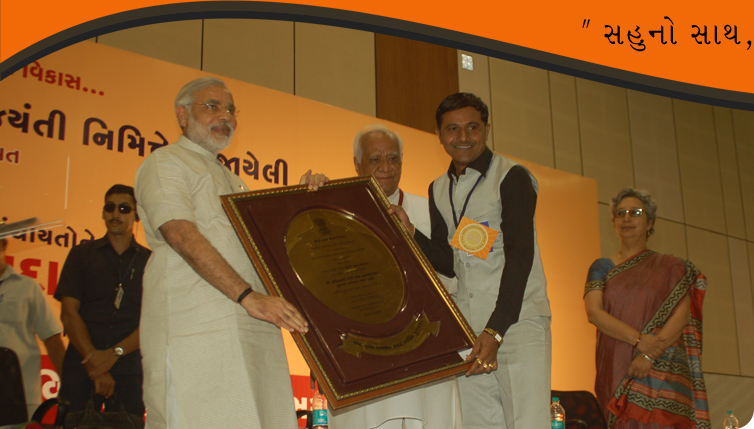 Gujarat has the best ecosystem for anything to develop. Corruption is less and chief minister is very supportive. People are little more co-operative. Results of his efforts have been magnified in such a supportive atmosphere. Also, he comes from a good family. He has good contacts in the system. But point is how many of those who have capacity to do something, actually use it for a good cause. He does not need to worry about his own livelihood much, but how much of us actually thinks beyond. He reminded me of Dr. Verghese Kurien who utilized all his skills, connections and other resources for mobilization of farmers with operation flood and dairy co-operatives. May his endeavors encourage people to set up many Punsaris all over the India and world. Encouraging read! Thanks for posting. which party he belong to ? Henna A Aggrawal - Very encouraging !!! Saw him being felicitated by Mr. Amitabh Bacchan in his tv serial. What impressed me most was his words " kisi bhi gaon may badlao laney ke liye wahan ke logo ki soch badalna Zaruri hai." Thanks for the post.